Play On: Memphis Tigers -1.5. The Memphis Tigers have been one of the most underrated teams in the country all season. They went 9-3 straight up this year and 7-5 against the spread to earn a share of first place in the American Athletic Conference with a 7-1 AAC record. While the nine wins are impressive, some of the losses they have had this year are equally encouraging. Memphis only had one bad loss all year, which was a 24-28 home loss to Houston in which it outgained the Cougars but gave the game away by committing five turnovers. Its 35-42 road loss to UCLA as a 22-point underdog was a great showing, and its 3-24 loss at Ole Miss as a 20.5-point dog wasn’t the blowout that the final score would indicate. The Rebels only led the Tigers 7-3 entering the fourth quarter before scoring 17 unanswered points in the final period. The numbers show that the Tigers are an elite team. They are putting up 34.7 points and 422.7 yards per game this season, while giving up just 17.1 points and 344.2 yards per game. So, they are outscoring teams by an average of 17.6 points per game, and outgaining them by 78.5 yards per game. Their defense is only allowing 4.8 yards per play and is one of the better stop units in the entire country. BYU was a team that had a chance to do some real damage this year if quarterback Taysom Hill had been healthy the entire way. Instead, he was hurt after a 4-0 start, and the Cougars have gone a mediocre 4-4 since his injury. They lost four in a row once he went down, including a 20-35 home loss to Utah State, and a 30-55 road loss to Boise State in a game they were outgained by 315 total yards. Yes, the Cougars have been playing much better of late, winning each of their last four games. But, those four came against Middle Tennessee, UNLV, Savannah State and California, all of which will not be going to bowl games this year. Simply put, the loss of Hill has made this offense rather pedestrian, and the defense really hasn’t been that good all season. Indeed, the Cougars are giving up 25.2 points and 384.2 yards per game against teams that average 26.4 points and 382 yards per game. So, by those numbers, this is just an average defense at best. They don’t defend the pass very well, giving up 267 passing yards per game. 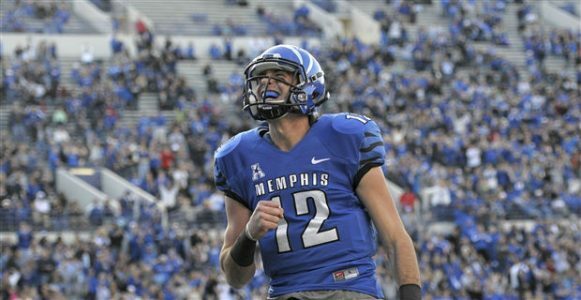 Memphis has been efficient through the air, averaging 64.0% completions, 231 yards per game and 7.4 per attempt. It should be able to move the ball via the pass without a problem in this one. Memphis will be the more motivated team Monday as it is ecstatic to be playing in this Miami Beach Bowl. That’s because it has not been to a bowl game since 2008, so these players will certainly be jacked up to represent their school. The Cougars dreamed of bigger and better bowls coming into the season, so this Miami Beach Bowl is a bit of a letdown for them. Memphis is 26-10 ATS in its last 36 vs. good offensive teams that score 31 or more points per game. BYU is 0-6 ATS in its last six road games after having won four or five of its last six games coming in. The Cougars are 20-36 ATS in their last 56 games after gaining 525 or more total yards in their previous game. The Tigers are 12-3-1 ATS in their last 16 non-conference games. The Cougars are 3-7 ATS in their last 10 games overall. Bet Memphis in the Miami Beach Bowl Monday. No. 3 Ranked Overall Handicapper in 2014! Jack Jones and his $1,000/game players haveprofited $75,520 this year in all sports! He has put together HUGE 455-374 & 131-92 Football Runs! He is also riding an EPIC 13-1 (93%) NFL Hot Streak over the past couple weeks! Jack caps off Week 16 NFL with a BANG by cashing in his 20* Broncos/Bengals ESPN Monday No-Brainer for just $34.95! One look at the PERFECT 100% NEVER LOST SYSTEM in his analysis and you’ll be sprinting to the pay window to place your wagers! His selection isGUARANTEED to get the money or Tuesday college football is ON JACK!